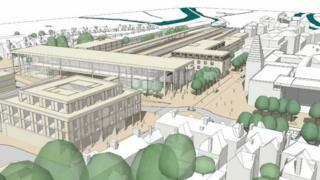 The masterplan for the £125m redevelopment of Oxford railway station has been released. The design for a new "gateway" to the city was developed by the city council, county council and Network Rail. It includes a multi-storey car park, bus interchange, hotel, housing and an improved Botley Road bridge. The current station is described as "poor" and its replacement should provide "a vastly improved level of amenity and experience". An architectural competition launched in 2015 came up with three designs that were used to produce the plan. The document states: "Oxford's unique historic character attracts many more visitors than most towns or cities of comparable size. "The comprehensive redevelopment of the station area provides an opportunity to significantly improve this part of the city centre in urban design terms." For the plan to go ahead, trees in front of the existing station and the nearby youth hostel would need to be removed. It will be considered by the city council's cabinet on Tuesday and if approved will go out for a public consultation. Image caption Aspects of the current station's design are described as "poor"